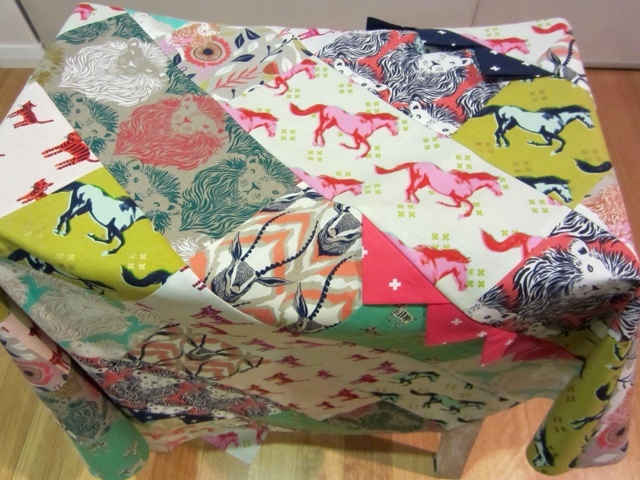 No, not the South-of-the-border themed party, but rather, the how-to's for creating the simplest, sweetest baby/toddler quilt going, BirdyStreet style- perfect to celebrate su bebe favorito! Last year, when Cotton&Steel's debut range arrived in shop, I gathered together all of their animal prints, thinking that a mini version of Fiesta would be the perfect backdrop for them. 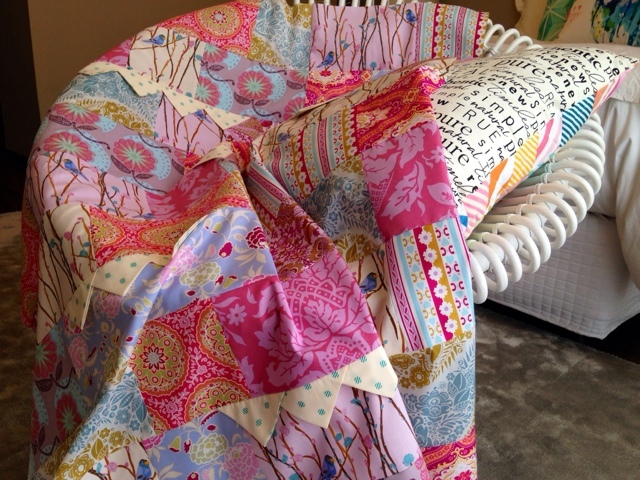 With a little sewing help from my friends, a scaled down baby sized version was born! Well that's the preamble, now here's the tutorial, as promised. 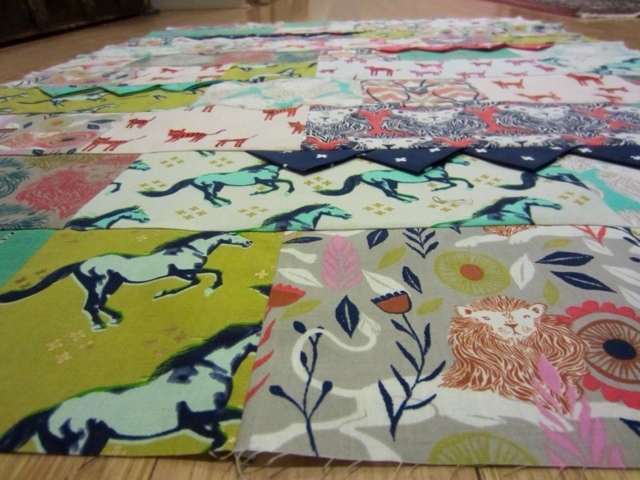 GATHER together a group of 10 fabrics for the body of the quilt. You will need 20cm of each print. Add an additional 3 contrasting prints to the mix for the prairie points. 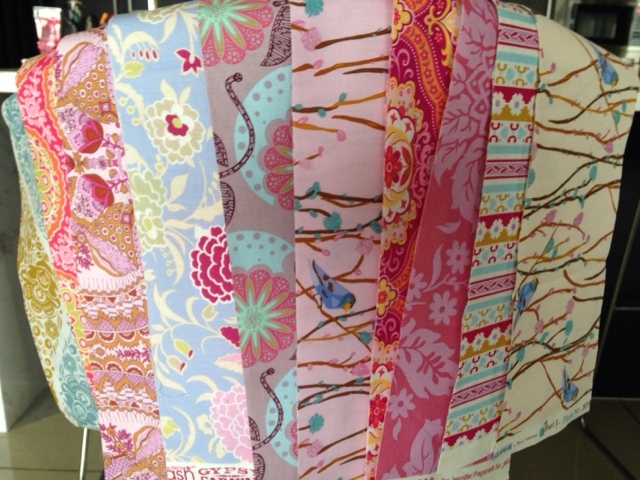 I chose prints that would stand out against the assortment of background fabrics. You will need 15cm of each print. The photo below shows the original Cotton&Steel fabric pull. Notice how the 3 contrasting fabrics for the prairie points, pictured on the left, are different in both colour and pattern. 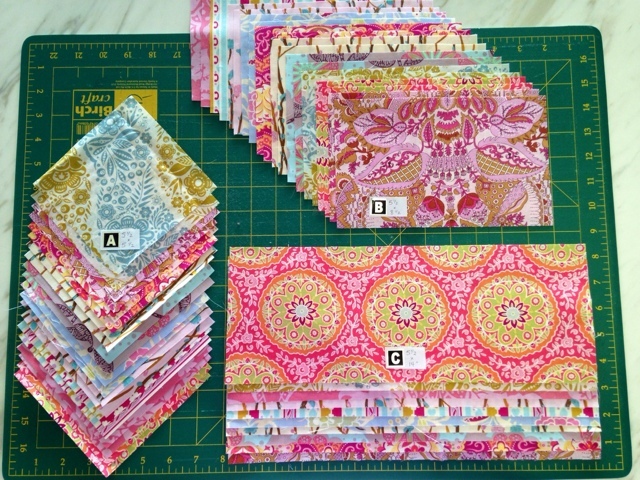 For today's tutorial, I have rustled up some fabrics from a limited stash in my KL cupboard. If I had an entire quilt shop handy, I would likely make some substitutions - I'm not convinced it's the perfect palate, but here goes! 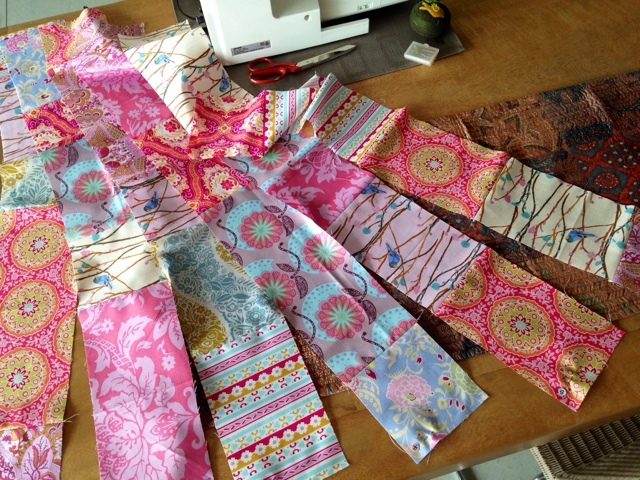 CUT one 5 1/2" strip from each of the 10 fabrics. This layout is so simple! The quilt has 10 rows. FORMULA: Each row has two (A) blocks, two (B) blocks and one (C) block. You can distribute these blocks in any order throughout each row. 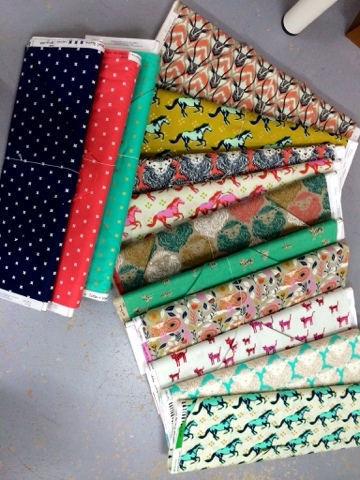 ARRANGE THE FABRICS: The photo below is an example of a possible layout. I move things around to ensure there is a pleasing arrangement of colours and prints. I try to keep the A's B's and C's separated between rows, but not always. You are looking for a balance of colour and motif, so mix and match, step back occasionally and take a look, rearrange if necessary until it looks "right" to your eye. Enjoy the design process! 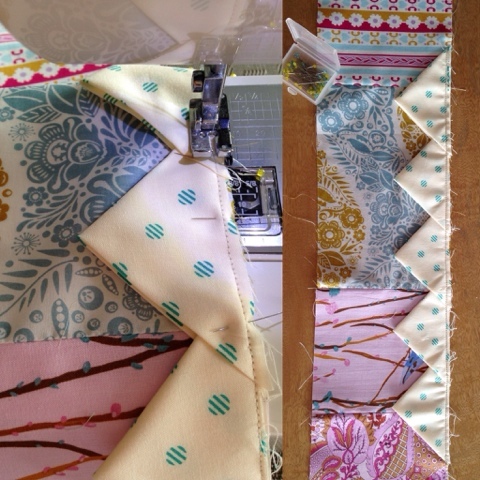 ASSEMBLE the 10 horizontal rows by sewing the A B C blocks together with a 1/4" seam. Now for the addition of the Prairie Points. These add a tactile element to the quilt, not to mention a point of difference and a bit of fun! 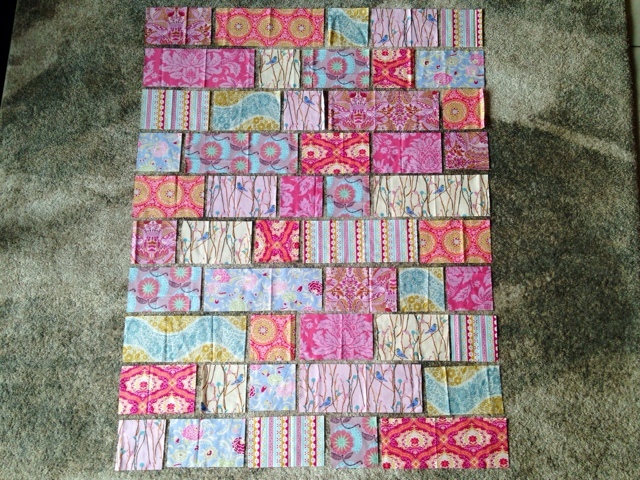 PREPARE them by cutting 16 to 20 4 1/2" x 4 1/2" squares. Fold each square in half along the diagonal. 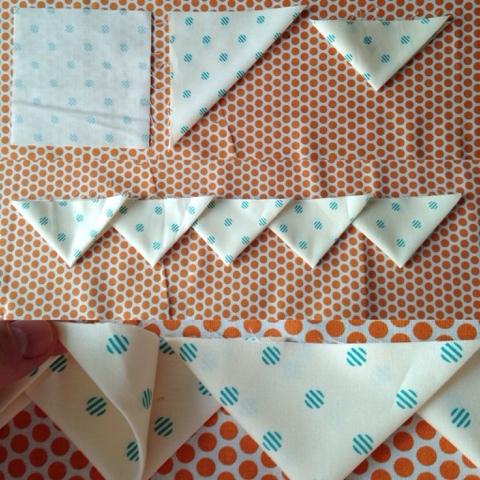 Fold in half again to achieve a small triangle with an "open" side. To make the sets, lay the triangles next to each other, points down, raw edges up, and open sides all facing right. Tuck the triangles into one another by nesting one pointy end into the neighbouring open side. (See photo above). Be generous with the overlap/"tucking in" process. *Because a child will likely pull on and play with these prairie point inserts, it's important for them to be sturdy and well reinforced. Therefore, sew each set along the raw edge with a scant 1/4" seam. ADD these sets of prairie points so that they are scattered around the quilt rows. Again, you are looking for balance in your arrangement. I introduced my sets to the tops of rows 3, 5, 7 and 9. Pin into place and reinforce again, sewing the prairie points to the tops of the rows, following the same scant 1/4" seam line. Sew your rows together. Row 1 to row 2, row 2 to row 3 etc. When you reach a set of prairie points, add some reinforcement with a back stitch at either end. FINISH by adding a layer of wadding and backing fabric, both at least 2" larger all the way around than your 40"x50" quilt top. 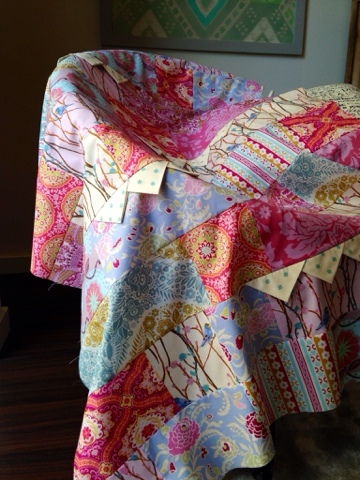 It's a manageable size for quilting with either your domestic machine or by hand for that extra bit of tlc! 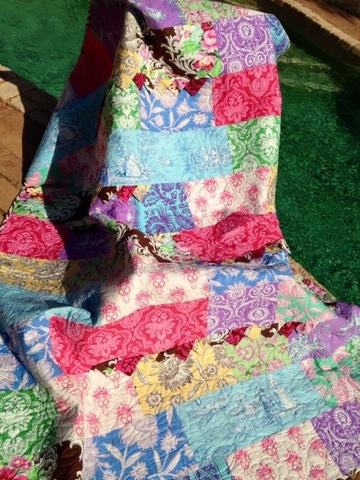 How easy was that and you now have a beautiful, one of a kind quilt for your little one. Thank you for reading and for trying this BirdyStreet design. *The photos and text and design are my own - if you'd like to share, please ask your friends to visit my blog rather than making copies. This pattern is intended for personal use by home sewers and may not be republished or distributed without my permission. 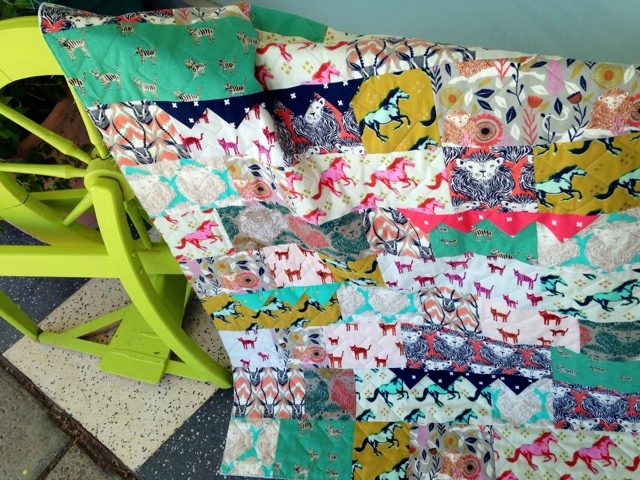 Quilts made with this pattern may only be sold in small quantities. Thank you SO much for this post! I adore this pattern - it's perfect for showcasing beautiful prints. And I think the fabric you had on hand is gorgeous! Thank you Carolina! I agree! Such a simple grid that lets the fabrics make the good impression! I look forward to seeing yours!